Who isn’t looking to be a little more productive and efficient with their time? Any time you can decrease the time it takes to complete a task or streamline some complicated process, everyone wins. If there’s a task to be done, rest assured there’s a piece of software aiming to help you do it faster, cheaper, quicker. From browser plugins to services that help you maintain important relationships, productivity apps aim to do it all, even if that goal sounds a bit ambitious. At the heart of all great productivity tools is a solution to a specific problem. Some look toward efficiency, aiming to take an existing product, such as email, and make it easier to use so we waste less time futzing with it. Others seek to silence the noise of the net, bolster collaboration, or unite disparate data. 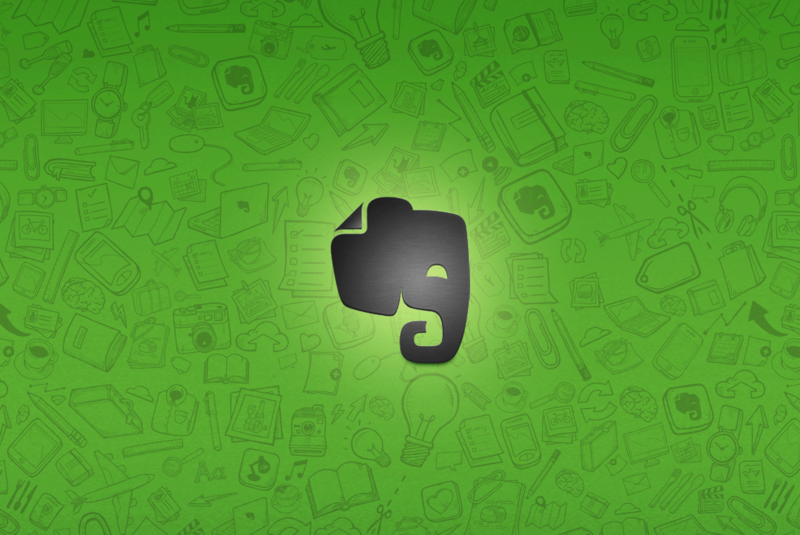 Evernote is on any productivity app list worth its salt and for good reason. It’s simply one of the best. With its cross platform integration and in-depth note taking capabilities, you can use this app for anything. The app allows users to create a “note” which can be a piece of formatted text, a full webpage or webpage excerpt, a photograph, a voice memo, or a handwritten “ink” note. Notes can also have file attachments. Notebooks can be added to a stack while notes can be sorted into a notebook, tagged, annotated, edited, given comments, searched, and exported as part of a notebook. The sky and your creativity are the limit. In-depth note management and formatting lets you use this for practically anything. Cross platform for all major desktop and mobile operating systems. With the premium you can sync your notebooks offline for viewing. Use this to make task lists, to-do lists, grocery lists, or notes for practically any reason. We have a hard time recommending a monthly subscription for a note taking app. May be too complicated for some people. Unlike any other planner, Diacarta lets you create a mental picture of your day. And now it syncs! It’s easy. Start with the clock, then choose icons to represent the things on your list. For scheduled events, simply drag the icon to the appropriate place on the clock. Tasks that are not tied to a specific time stay on the screen as a reminder. By tapping on the icon, you can add as much detail as you need for future reference. Star your event when it’s complete. Getting everyone on the same page is hard enough with just five other co-workers, let alone fifty new volunteers you may have never met. Doodle can be a valuable tool for coordinating a large event like volunteer training as well as a small event like a monthly meeting with the board. Work together how you want, when you want. Create and collaborate on documents with others and keep everyone organized and up-to-date with shared notebooks. Stay focused on what you care about. Use built-in intelligent suggestions, find helpful information, and gain useful insights to create your best documents, all without leaving Office. Tame your inbox and end headaches with finding the latest versions of documents once and for all. Competitively priced – How much of a benefit this is depends on how many users/licenses your organization needs and, more importantly, on how often Office upgrades are performed (upgrades to new versions and not security patches). Email hosted in the cloud – Price and feature wise, it beats almost every major hosted Exchange provider. Easy administration of email – Speaking of email, administering it with Office 365 is a lot easier. Most settings and configurations are available through an easy-to-use web interface and, for IT power users, there’s also a PowerShell interface. Easy and simple file storage and synching – Each user gets a set amount of space via SkyDrive that they can use to upload all their documents and share it with very granular levels of privacy. Access your files anywhere – Most plans give you access to the web version of Word, Excel, PowerPoint, and OneNote. This means you can access, create, and edit any of your files from any computer or mobile device with an Internet browser. Mobility – Most plans will give users access to mobile apps for a variety of mobile platforms (Windows Phone, iOS, and Android). Collaboration and Communication – With SharePoint and Lync Online hosted on the cloud, collaboration across your business will be easier than ever to set up, run, and use. Scalability, Security, and Stability – All of these pros benefit from the proven architecture of the Microsoft data centre infrastructure. The hardware and software of these data centres were built for scalability, security, and stability to ensure continuity of business for all its customers (keep in mind that even Microsoft uses these same data centres internally). Subscription based – Having yet another recurring fee to pay might not be the best for your business. Less flexible infrastructure – Since email (and optionally SharePoint Online) infrastructure is hosted in the cloud, there is less flexibility in the configuration and customization typically experienced with on-premises options. Software boundaries and limits – Some of the hosted offerings, like SharePoint Online and Exchange, are throttled and don’t allow for the same capacity limits that their on-premises counterparts provide. Data privacy – All your private business data will live on Microsoft’s servers. This might not be a concern for everybody, but for certain use cases it might be even impossible (due to legal reasons) to have your data hosted outside your organization. Use Skype for business to host online meetings and share your screen with the audience so that they can see your presentation on their own laptops… or even give them control of your computer for real collaboration. Skype for business is included within your Office 365 subscription, so it integrates perfectly with other office tools such as outlook and PowerPoint. Helped to Remove Barriers. Lync communication tools and Skype have continued to exist as separate entities, but Microsoft has successfully created a way to put people back in center of communication. Puts Microsoft Ahead of the Competition. Prior to the infusion of the two communication platforms, Lync was widely used in enterprises because of the advanced features and ease of use. Increased User Adoption. Whereas new-user adoption used to be a drawback of using Lync, Skype for Business has made it easier for users to feel comfortable switching from Skype to Lync. Closer communications, more efficient communications. Bandwidth Usage – Office 365 Lync has been criticized in the past for the amount of bandwidth is uses up. Distraction. With more communication portals available, end-users may find it difficult to stay on task. Need of Third-Party Tools, because Lync’s encrypted messages have to work across both platforms, third-party tools may be required in addition to available Microsoft solutions to ensure successful monitoring. 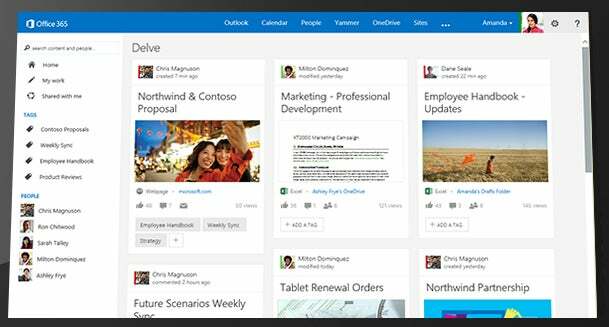 Office Delve surfaces personalized content to you from across Office 365 – from OneDrive for Business, SharePoint, Exchange, Yammer and more. Powered by the Office Graph, Delve brings you information based on what you’re working on, who you’re working with; always maintaining established permissions. Get new features fast. Using an on-premises solution means that you’re now on a slower release schedule for the best features. Migrating to Office 365 gives you peace of mind that your system will have lots of uptime: more than 99.9 percent, as measured between 2012 and 2013. Office 365 provides ready-to-go intranet, so you’ll minimize the hassle during setup and installation. Office 365 has tools like Skype for Business, the Yammer social network, virtual machines, screen sharing, file sharing, file management and a terabyte of storage on OneDrive. Lack of control. An on-premises SharePoint solution provides control of both the front and back end for your organization. Breaking customizations, When Microsoft rolls out updates to SharePoint Online, the latest changes could break the business-specific customizations that you’re used to and that you’ve worked hard to build. Increased bandwidth. If you find that working with Office 365 is a slow and painful experience after migration, you may need to increase your bandwidth with your Internet service provider. If you’re already heavily invested in the Microsoft ecosystem you can just as easily jump on board the Microsoft train on Android. With Microsoft Office you get the standard PowerPoint, Excel, and Word functionality in mobile format. You can also download the OneDrive app which is Microsoft’s cloud storage app and OneNote, Microsoft’s (admittedly buggy) note taking app. Using it you can sync files effortlessly between PC and Android. Full office suite + cloud storage with 7GB totally free. Reasonable prices for more storage (although not as reasonable as Google Drive). Effortless syncing from PC to mobile and vice versa. Excellent for use with Microsoft Office on PC. OneNote isn’t very good sadly. OneDrive works pretty well but functionality could be improved. Some people have had issues with bugs. Last on our list is Wunderlist. This is a very clean and easy to use task management list that also has cross platform support and is free to use. It allows for collaboration and task sharing and even has some light theming options to make it more pleasant to look at. Create, share, and collaborate on tasks. Light theming options to customize your look. Free version is surprisingly powerful. Mobile and web versions available for cross platform use. Most of the best features require the A monthly subscription. Subscription price a little steep for non business consumers. Powerful solution to embed legally binding signatures into documents with a few clicks, then share. One of family of Add-ins for Outlook, Word, SharePoint and Office 365. Drag & drop interface, robust web back end. With DropBox social and link sharing are super easy. If you have many business documents this is a great tool to have as a sharing feature that others will love. It’s simple and playful as well as being informative and useful. Reliability: Your files are is constantly available through stationary computers or mobile devices. Ease of use: The file-sharing and group file-sharing features are by far easier to use than any other file sharing application to date. Digital Downloads: You can use your account for your giveaway items so that you always have the latest version without having to change or upload files to your server. 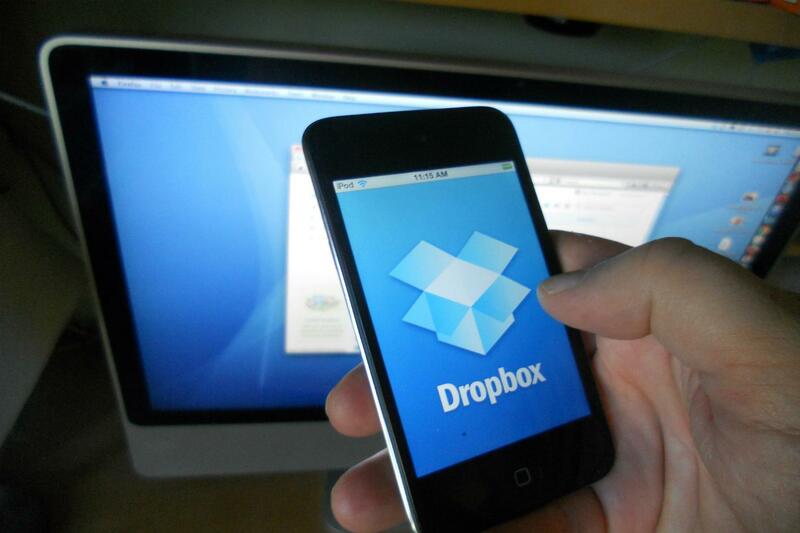 Synchronization: Dropbox allows you to effortlessly synchronize your files once they have been uploaded to your account. History: The unique “History” feature allows users to access previous versions of their files. File location: At times, the lack of specific tabs can make it difficult to locate older versions of files or deleted copies. The service is free for the first 2GB of storage, and you can earn extra space by encouraging others to sign up. Collaboration: You can add notes and such to a document but you cannot edit in real time. Companies need to consider what is best for them. This can be achieved by speaking to key members of the team and analysing the business to see which areas need improvement and discover what needs to be solved. This insight can then help create a custom app bespoke to the business.